Finally Pakistan was able to defeat South Africa in second T20 with great batting performance after losing several ODIs and T20 matches earlier this month. Two match T20 series is is drawn by 1-1 after Pakistan's victory. Now both teas are ready to play 3 match ODI series. 1st ODI is taking place on Sunday In Cape Town and it will start at 2 PM according to Pakistan time. We seen some fantastic batting performances in last match by Pakistan specially by Umar Akmal who scored 64 runs and by Mohammad Abdul Hafeez who made 64 runs. This is how Pakistani batsmen needs to perform even in ODI series for victory. In bowling Pakistan would be missing Mohammad Irfan who is out of the team due to Injury. Umar Gul is also not available due to his operation. Bilawal Bhatti shown great performance in T20 series so he might be included in ODI matches. 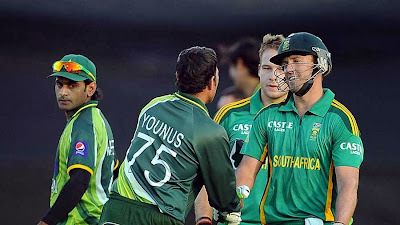 For South Africa two young players Graeme Smith and Jacques Kallis are back in the side. Imran Tahir is also Included in the ODI side to his amazing performance in T20 and test matches. Faf Du Plessis is not Included in the squad. Earlier this month Pakistan lost five match ODI series to South Africa by 4-1. Head to head 68 ODIs are played between both sides. South Africa is far ahead by winning 46 matches and Pakistan won 21.